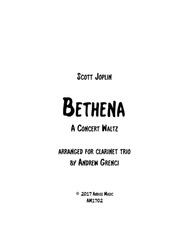 "Bethena" is a "concert waltz" by the king of ragtime, Scott Joplin. It is characterized by tender melodies, interesting harmonies, and many mood changes offering opportunities for the performers to add interpretive elements such as rubato and dynamic interest. This arrangement will be a perfect compliment to a recital program or party chamber music repertoire. 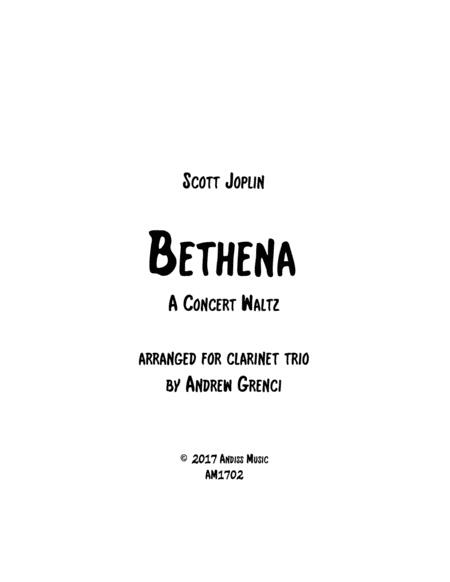 Arranged for two Bb clarinets and bass clarinet, it is playable by good high school clarinetists, but also musically fulfilling for professionals.